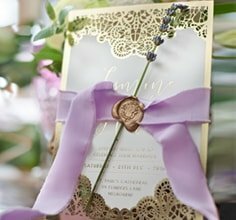 Place cards that match your wedding stationery are essential in completing the overall experience. Other than serving the purpose of identifying guest seating locations, Giant’s luxurious place card design will significantly enhance the reception décor. No doubt significant amount of time will be spent deliberating the ideal seating arrangements; by using Giant Invitations personalisation service simply upload your guest list (in a spread sheet document) and our designers will take the DIY headache out of the process.